On this episode of the podcast we talk about how to mix brass in different styles of music. 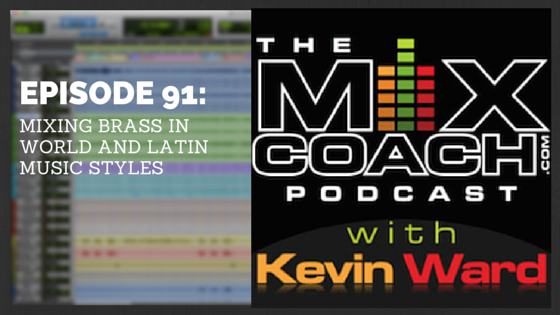 Kevin takes a question from a listener asking about how to mix brass instruments, as well as how mixing brass in Latin, World, or South American music styles might be different than mixing brass in rock or pop music. If you are interested in learning more about mixing brass, check out The MixCoach Guide to Mixing Jazz and Big Band. – Compare your mix to a good reference mix so you can hear what the brass in that style of music should sound like. – When mixing brass, one of the main things to consider is balance. Make sure you can hear all of the parts well, paying particular attention to the vocal or instrument with the melody. Support the melody part with all of the other parts. Do you have any tips for mixing world or latin music? Let us know! Previous Post What To Do When Your Parallel Compression Sounds “Phasey” Next Post Could You Be Making Your Listener Look Bad?